Gokulnath Sabapathi received his B.Sc (2000) in Chemistry and M.Sc (2002) in Inorganic Chemistry from University of Madras. His doctoral work was in the synthesis of various core-modified expanded porphyrinoids with altered structural and electronic properties under the direction of Prof. Tavarekere K. Chandrashekar at Indian Institute of Technology Kanpur, where he received his Ph.D. degree in 2009. He then joined as a Global-COE postdoctoral fellow in the laboratory of Prof. Hiroyuki Furuta at Kyushu University, Japan in 2009, to work on exploring the unique properties of N-Confused Porphyrinoid systems. In 2012, he moved to National University of Singapore, to join the research group of Prof. Chi Chunyan to work on pi-conjugated systems targeting for n-type semiconductor materials. In 2013, he joined Inorganic and Physical Chemistry at Indian Institute of Chemical Technology (CSIR-IICT, Hyderabad, India as a DST-Inspire Faculty and worked until August, 2015. 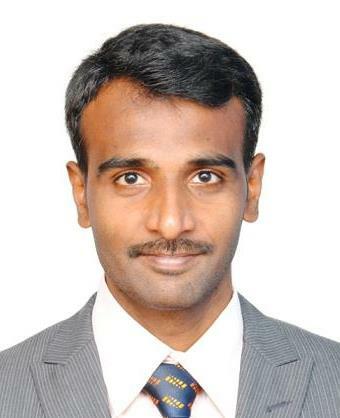 Since August 2015 he is working as Assistant Professor at the School of Chemistry, Indian Institute of Science Education and Research (IISER) Thiruvananthapuram and his research interests include synthesis of planar ?-conjugated macrocycles for near-IR applications, molecular probes for toxic elements sensing, solar energy conversion and heteroditopic receptors.